Remember the designer jumpsuit I wore at the Dress to Kill Blogger Review? 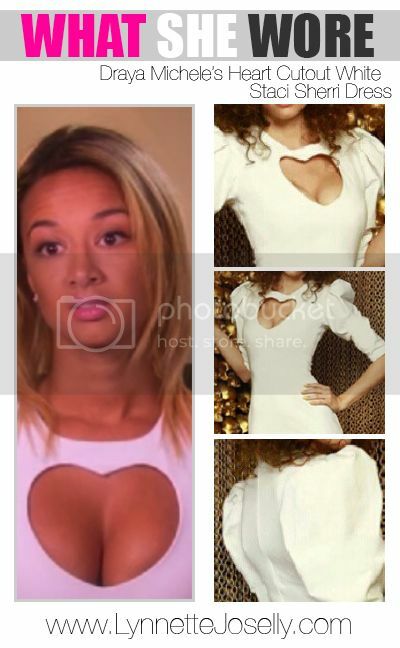 Well here is the most fashionable "Basketball Wife" Draya Michele wearing the white Love is Key Dress by Staci Sherri. Celebrity stylist, Scoot3er, always has this reality TV star looking on point! I remember seeing this dress at the boutique, and would have so tried it on but unfortunately I don't have the cleavage for this dress, haha. The dress features big puffy sleeves and a heart shaped cutout keyhole in the chest area. The $100 dress also comes in a floral and a tropical print. You can purchase Staci Sherri designs at Dress to Kill Boutique in Wynwood Miami.